La Bloga interviewed author Amy Costales about her first picture book. Where did she get the idea? What was the process from manuscript to published book? This is what Amy shared with us. 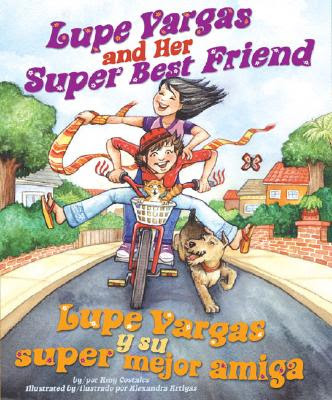 I started the book Lupe Vargas and Her Super Best Friend after giving my students a writing assignment. It was 2000, and I was teaching Spanish in Thailand. I told my students to write about a childhood friend. They were supposed to practice preterit and imperfect verbs. I modeled for them, talking about my own childhood friend. That got me thinking, and while my students were writing, I picked up a pen and wrote right along with them. I wrote about the funny things I used to do with my friend Clara, and how we used to annoy our neighbors, and how we got in a pretty bad fight one day. I was trying to focus on the essence of childhood. For me that is having enough free time that is not controlled or planned by an adult. I had a lot of time like that when I was a child. In the story, Lupe and Maritza enjoy their free time, making up games and having adventures. Every thing that occurs in the story, even the fight, is something that Clara and I did as children. After getting all those memories down I decided to shape them into a story. I looked for a structure, and suddenly got the idea of using a week in the life of the two girls. I wasn’t sure if that was a good idea. I tried to imagine the reaction of an editor and I wondered if the structure would seem interesting or unsophisticated. I went ahead and tried it. I wanted to show that day after day these two girls play together, just being kids. When one is gone, the other one misses her. At the end of the week, however, they have a fight. That fight, like I said, is one I had with Clara. I don’t think I’ll ever forget the feeling of shame that came over me, nor how I felt the next day when I knew I was not going to play with my super best friend. I also remember the feeling of relief after apologizing, and being forgiven. I included that fight because it is part of childhood, and because I wanted the story to have a conflict that needed resolved. I finished the story, but lacking confidence, I put it in my filing cabinet, where it rested for a couple of years. I moved to India, where I also taught Spanish. My son was born. I guess I was busy teaching, raising my children, and exploring Delhi. But one day I visited a friend in California. She had stayed home for fifteen years, raising her kids and baby-sitting to supplement their income. She secretly saved half of her babysitting money all those years and one day surprised her family with the down payment for a home. I was so amazed that I immediately wrote This House is Ours (Luna Rising 2008). Determined to submit it, I went to our school library in Delhi and looked at bilingual picture books. I decided that Luna Rising was the publisher for me. Well, they rejected that story at first, but did ask me for more work. I pulled Lupe Vargas and Her Super Best Friend out of my filing cabinet and sent it. I was scared. I felt like this was my big chance and I was worried they wouldn’t like the story. A couple of months later I got a message from my mom to call Theresa Howell at Luna Rising. When Theresa told me they wanted to publish the Lupe story I was so quiet that she asked me if I was excited. Of course I was. I was so excited that I could barely talk! And it was, after all, the middle of the night in Delhi. At first I was worried about the whole editing and illustration process. I thought I might feel like I had lost control of my story. But I never did. Theresa asked for three big changes. Señor Ramírez became Señora Ramírez. Lupe now has adult supervision while preparing food. Lastly, the way in which Lupe apologizes changed. I originally had Lupe make a quesadilla. Theresa suggested that the apology should reflect the fight, so now Lupe makes a magic potion, because the fight occurred when Lupe refused to share their magic potions. As for the illustrating, Theresa asked me for my opinion during the process, which I appreciated. I love the playful style Alejandra Artigas used, and she added details that strengthen the story. It was really cool to see the images the words created in her mind. To me it felt like some intimate form of communication with a person whom I have never met. I loved the editing process.